Today, companies large and small race to capitalize on the rapidly growing IoT and embedded system markets. Design engineers face many challenges-acquiring and mastering new technologies, developing code for low-level system infrastructure, performing integration and test, meeting aggressive schedules - all while facing intense cost and resource pressures. A solid embedded software platform is the answer to these challenges by freeing resources to develop differentiated products instead of creating and maintaining the fundamental, yet essential system structure underneath. Renesas Synergy™ is a platform that is truly complete, fully tested and qualified, and systematically maintained and supported so you can start your application software development immediately at the API level without worry. you will be granted the MicroConsult Training Certificate. You get an overview of the Renesas Synergy™ platform and the main mechanisms of the Express Logic ThreadX RTOS. You get the perfect entry into practical application and can implement your own applications based on the Renesas Synergy™ platform. 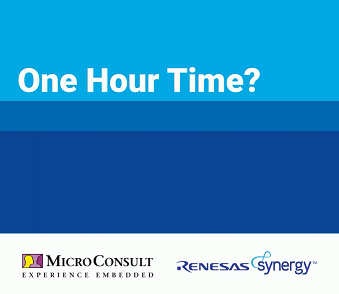 The Renesas Synergy™ Online Training "One Hour to RTOS" addresses embedded software developers, software architects, technical support and application engineers. Experience with programming in ANSI-C/embedded C; basic knowledge of microcontroller architectures and their peripherals. FREE: Participants of the Renesas Synergy™ Online Training get a free Renesas Synergy™ SK-S7G2 Starter Kit with color QVGA touchscreen, Ethernet, USB, CAN, RS485 and a powerful S7G2 240MHz Cortex-M4 processor. Date: The online training can be started at any time. Request a free voucher code in order to attend the online training at no charge. (Normal cost 390 Euros + VAT). The button “Free Voucher“ directs you to a form that requests your contact data. Based on this data, Renesas reserves the right to provide you with a voucher code for the online training, and you will be kept up-to-date by e-mail. Your voucher code and log-in link will be provided via e-mail. Moreover, the free starter kit and log-in data will be sent to you by regular mail. In case you are not provided with a voucher code, you will be notified by e-mail. You can then choose to register for the online training at your own expense. The notification will contain a dedicated registration link to this end.